The Vols received good news late last week when their top target in the 2019 class announced he would be making his college decision later this month. And on Saturday night, they received even more good news from the highest-rated player still on their board. Josiah James is listed as the No. 1 point guard and a five-star prospect according to 247Sports. And on Saturday, he released a list of his top nine schools in his recruitment, and the Vols made the cut along with some blue bloods of college basketball. Tennessee has continued to make James a priority in this class. James received a visit from Tennessee in mid-April and again from head coach Rick Barnes in late April. The Vols also sent assistant Michael Schwartz to watch James play for the USA U18 Team in June. The 6-foot-6, 195-pound guard has continued to rise in the recruiting rankings this summer. He moved into the top-20 overall players in the 2019 class on 247Sports back in April, and now he’s nearly inside the top 10 prospects for this cycle. The 247Sports Composite rankings have the five-star guard as the No. 12 overall player and No. 1 point guard in the entire 2019 cycle. The regular 247Sports rankings list him as the No. 10 player in the country. James and four-star Tre Mann are likely the Vols’ top two targets at point guard. And though he’s listed as a point guard, James’ height and athleticism might make him a better fit at shooting guard or even at small forward. James primarily plays shooting guard in high school. But given his size and ability, he can probably play three positions in college. James has the passing and awareness to develop into a quality point guard, but he also has the smooth shooting ability to thrive as a shooting guard. The lefty can also cut and slash to the basket effectively and is rangy like a small forward. He’s a very versatile player who is also pesky on defense. In nine recorded games from this past high school season on PrepCircuit.com, James averaged 11.3 points, 8.2 rebounds, and 5 assists as a junior for Porter-Gaud High School. 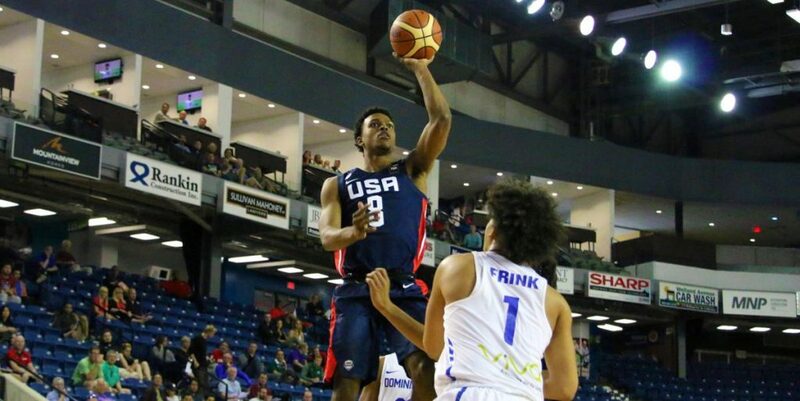 In six games for the USA U18 Team, he averaged 5.3 points, six rebounds, 1.8 assists, and 1.2 steals in 16.3 minutes per contest according to FIBA. The Vols will likely need a guard or two in their 2019 class and definitely a couple in their 2020 class. Jordan Bone, Jordan Bowden, and Lamote Turner are all juniors heading into the 2018-19 season, and the Vols will have to replace all three after the 2019-20 season. Right now, Tennessee has two commitments in their 2019 recruiting class. Three-star power forward Drew Pember from Knoxville and three-star small forward Davonte Gaines from New York are the Vols’ two pledges in this recruiting cycle. Tre Mann is Tennessee’s top point guard target in the 2019 class, but James is a versatile player who could find a role on any team across the country. Beating out blue bloods like Duke and Kansas to land James in the 2019 class will be difficult, however. But the Vols’ staff won’t quit fighting for him.